Tokyo is known for historic sites, parks, museums, shopping, and nightlife. Your plan includes some of its best attractions: make a trip to Meiji Jingu Shrine, ponder the world of politics at Tokyo Metropolitan Government Buildings, take in nature's colorful creations at Shinjuku Gyoen National Garden, and admire the landmark architecture of Tokyo Skytree. For ratings, other places to visit, traveler tips, and tourist information, read Tokyo trip itinerary planning website . Auckland Central, New Zealand to Tokyo is an approximately 14.5-hour flight. You can also do a combination of flight and train. The time zone difference moving from New Zealand Standard Time to Japan Standard Time is minus 3 hours. Expect little chillier weather when traveling from Auckland Central in January: highs in Tokyo hover around 11°C, while lows dip to 1°C. Finish your sightseeing early on the 9th (Wed) to allow enough time to take a train to Kanazawa. Kick off your visit on the 10th (Thu): don't miss a visit to Omicho Market, wander the streets of Higashichaya Old Town, step into the grandiose world of Kanazawa Castle, then take in nature's colorful creations at Kenrokuen Garden, and finally explore the world behind art at 21st Century Museum of Contemporary Art. For maps, where to stay, traveler tips, and more tourist information, refer to the Kanazawa tour planner. Take a train from Tokyo to Kanazawa in 2.5 hours. Alternatively, you can do a combination of flight, bus, and train; or drive. When traveling from Tokyo in January, plan for slightly colder days in Kanazawa, with highs around 7°C, while nights are about the same with lows around 0°C. Finish your sightseeing early on the 10th (Thu) so you can travel to Hiroshima. Kick off your visit on the 11th (Fri): explore the historical opulence of Hiroshima Castle, then pause for some photo ops at Atomic Bomb Dome, then don't miss a visit to Hiroshima Peace Memorial Park, and finally see the interesting displays at Hiroshima Peace Memorial Museum. To see reviews, maps, ratings, and other tourist information, go to the Hiroshima route website . You can do a combination of train and flight from Kanazawa to Hiroshima in 4.5 hours. Alternatively, you can take a train; or drive. January in Hiroshima sees daily highs of 11°C and lows of 2°C at night. Cap off your sightseeing on the 11th (Fri) early enough to catch the train to Himeji. Start off your visit on the 12th (Sat): don't miss a visit to Shoshazan Engyoji, take in nature's colorful creations at Kokoen Garden, then take in the pleasant sights at Himeji Castle, and finally don't miss a visit to Otemae Street. For reviews, photos, maps, and more tourist information, read our Himeji trip planning app . Getting from Hiroshima to Himeji by train takes about an hour. Other options: drive. January in Himeji sees daily highs of 10°C and lows of 3°C at night. Finish your sightseeing early on the 12th (Sat) to allow enough time to take a train to Kyoto. 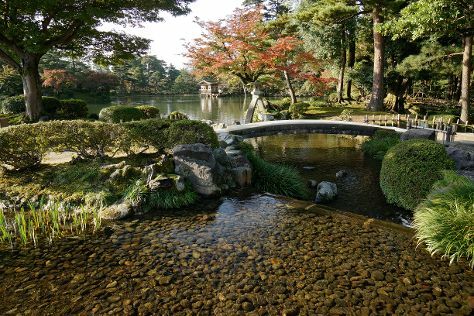 Kyoto is known for historic sites, shopping, parks, classes, and museums. Your plan includes some of its best attractions: get great views at Kiyomizu-dera Temple, take in the spiritual surroundings of Ryoanji Temple, take in the views from Togetsukyo Bridge, and contemplate the long history of Fushimi Inari-taisha Shrine. To see more things to do, other places to visit, and other tourist information, you can read our Kyoto travel app . You can take a train from Himeji to Kyoto in an hour. Alternatively, you can drive. In January, daytime highs in Kyoto are 10°C, while nighttime lows are 1°C. Wrap up your sightseeing on the 15th (Tue) to allow time to travel to Kita. On the 16th (Wed), enjoy breathtaking views from Kuchu Teien Observatory and then get in on the family fun at Universal Studios Japan. Get ready for a full day of sightseeing on the 17th (Thu): explore the historical opulence of Osaka Castle, meet the residents at Osaka Aquarium Kaiyukan, and then shop like a local with Dotonbori. To see more things to do, maps, ratings, and more tourist information, read Kita trip itinerary maker app . You can drive from Kyoto to Kita in 1.5 hours. In January, daytime highs in Kita are 10°C, while nighttime lows are 1°C. Finish up your sightseeing early on the 17th (Thu) so you can travel back home.